Sponsored by the Joe’s Movement Emporium, Hyattsville Community Development Corporation, M-NCPPC Department of Parks & Recreation, Maryland State Arts Council, and the Prince George’s County Arts & Humanities Council, the guide is available online at MyGatewayArts.org (click here) and in print at the following locations: Maryland Milestones, Hyattsville Community Development Corporation, Prince George’s Arts & Humanities Council, Prince George’s African American Museum and Cultural Center, Brentwood Arts Exchange at the Gateway Arts Center, 39th Street Gallery, Art Works Now, Pyramid Atlantic and Joe’s Movement Emporium. The Arts Learning Resource Guide highlights lifelong educational opportunities in an arts district that is home to over 500 artists, 150 studios and dozens of artist collectives. With so many levels of creative engagement from introductory classes to master experiences for every age, and in every medium, the guide seeks to give residents and visitors access to the wealth of knowledge offered. This Guide is roughly organized by arts education services based on age group and type of arts interest. Please refer to our Table of Contents on page 3 to find incredible arts education experiences for yourself or your loved one. Whether you’re looking for your partner, your child, your friend or yourself, you’ll find the arts live here! The Prince George’s Gateway Arts District is a 2 mile stretch of creative industries encompassing four towns along two miles of Route 1. Each of the four towns – Mount Rainier, Brentwood, North Brentwood and Hyattsville – has a strong sense of place as an individual neighborhood with a unique cultural history. The arts and cultural community emerged from these tight-knit towns. Locally, they have an economic impact that supports small business and housing development in the Maryland-Washington, DC suburban area. Regionally, the arts community reinforces the brand of: funky, creative, green, and culturally-rooted. 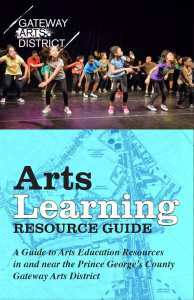 The Arts Learning Resource Guide is a living document. Periodic updates will be made to the online edition and to the annual printed guide. Know an organization or arts institution that should be listed and is not? Please enter your information as you'd like it to appear in the guide using this form.